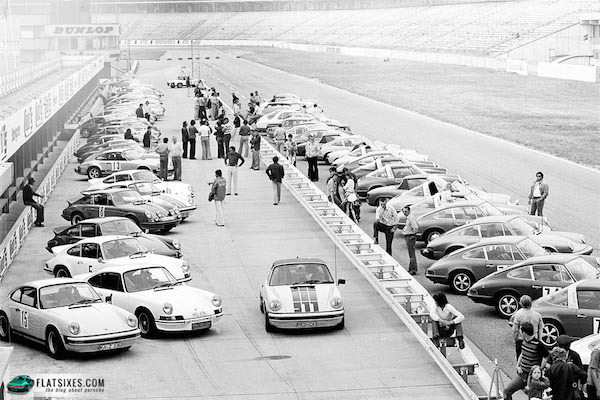 A simple driving workshop 40 years ago laid the foundation for today’s Porsche Sport Driving School. It was prompted by the premiere of the high-powered 911 Turbo at the Paris Motor Show in 1974. Even before sales got underway, Porsche engineers and dealers realized that practice was needed to drive the new top model at high speeds safely. The workshop was designed to provide the skills needed to ensure that driving pleasure would not come up short. The following story was reprinted with permission from Porsche's Christophorus Magazine. Sound swells from the boxer engines on the track. Brakes squeal. The air smells of rubber, oil, and gasoline at the Hockenheimring in early August of 1974. The drivers racing their 911s around the track are following not the stopwatch, but rather the ideal line. They are calm, commanding, and conducted. Off to the side a few sports cars are weaving through a lane of cones, drifting on wet circular tracks, and evading obstacles that suddenly arise. Nothing is unusual. What is out of the ordinary, however, is the people behind the wheels. They are not professional racers but everyday drivers-students at the newly founded Porsche Sport Driving School. The “we” in that statement are the driving instructors and trainers. One of approximately one hundred instructors worldwide is Carsten Dreses. The 43-year-old steps back from a session to describe the objective: “We want to instill an instinctive feel for driving and with it the art of reading and understanding the car better. When drivers sense the harmony in their cars, they’re automatically more secure- and also faster as a result.” He returns to shouting instructions to his drivers. Dreses knows what he’s talking about. A full-time development engineer for Porsche, he enters endurance races in his free time. Since 2004, he has been imparting the skills of safe and fast driving to eager students around fifteen times a year. “It’s just as important now as it was forty years ago-not to concentrate on lifeless theory but rather on driving pleasure,” says Dreses’s colleague, Klaus-Peter Krüger. An engineer, the 57-year-old Krüger joined Porsche in 1981 and since 1991 has also been working part time as an instructor and supervisor for the Porsche Sport Driving School. After 23 years, he remains just as enthusiastic about the concept and the content of this special school. “It’s still a matter of teaching the right way to sit, steer, and brake,” he notes. “But with ABS, Porsche Stability Management [PSM], and other driver assistance systems in the background, cars now behave differently at their limits. We show the drivers the situations where the individual systems kick in to support them.” Behind him, the students are now weaving deftly past the cones. The Porsche 911 Turbo was one of the reasons for the first courses at the Porsche Sport Driving School. The super sports car was scheduled to be presented at the Paris Motor Show in October of 1974, and was to be sold starting in the spring of 1975. After the first training sessions, it was clear to the engineers and dealers that drivers needed sure hands and a high degree of control to handle this car and its spectacular power and speed smoothly and safely. 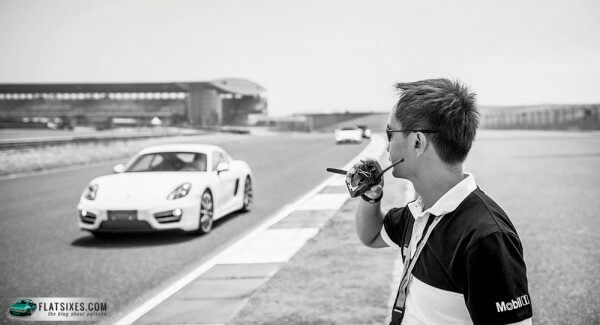 Aware of its responsibility to non-racing drivers, Porsche developed special driver training programs that teach appropriate and, above all, safe handling of its super sports cars. It started by offering training for “normal” Porsche 911s in August of 1974, and then a few months later for Turbo versions. Word quickly got around among customers, and the few available places were quickly booked. The instructors are experienced, having come directly from the “Test Course University” or the “Training Lab” in Zuffenhausen or Weissach. They are Porsche employees, and are pleased to impart their knowledge. They are natural, enthusiastic, and committed, with a finely calibrated foot on the gas and a highly developed instinctive feel for the cars. They teach the high art of driving to groups of at most ten students. The structure of today’s courses has not changed much since the start. The instructors explain the correct seating position with a steeper backrest and the importance of warming the engine. The exercises are solid and challenging, and allow drivers to try out very different maneuvers than they otherwise could on public roads, such as how to respond correctly to obstacles that suddenly arise or to curves that are tighter than they appear, how to drive through slalom courses or chicanes, how to react to skidding on a slippery surface, and how to find the ideal line. At the end, technique and style are evaluated. “Then as now, our aims have always been to train the right responses to critical situations and to familiarize drivers with the limits,” says Krüger. While the very first courses were based on the improvisational talent of the instructors, today they are clearly structured and organized and the content is conveyed in a more compact form. At the same time, there is a greater emphasis on driving pleasure. The courses can last from one to three days, depending on what customers select. “Today we offer courses suitable for everyone, from beginners to racing drivers. We didn’t do this forty years ago, or even twenty,” says Krüger. In addition to classical sessions on safety and racing tracks, there are also off-road and winter courses. Compared to the early days, the demands placed on the participants have changed. “The customers come with an ever greater degree of interest and ambition,” observes Dreses, while Krüger nods in assent. “They don’t just want to drive better and more safely, they also want to understand when and how the cars do what they do.” The professionals are precisely aware of the differences and fine points of the Porsche cars, and provide comprehensive answers to their students’ questions. Can Your Porsche Climb A Ski Slope?